IS BARACK ALL JUST BLUSTER? After a remarkable few days, yesterday I found my brain reeling from all the visual images and the ‘sound bytes’ which have dominated our media for the last week or so and which culminated with the visit of US President Barack Obama and his wife Michelle. But whereas the visit of the Queen was entirely satisfying and, dare I say it, moving, the visit of Obama was not in the same league at all. Did it suffer by the comparison with one of the most important events to have taken place in the last century in this country? Or (shock horror) is President Obama not quite living up to his own ability to communicate and to generate PR for himself? On arrival at Aras an Uachtarain I was struck by Obama the Showman, as he yelled to the assembled media “Good morning, how are you all doing?” But perhaps he was just doing what many Americans do naturally – oozing confidence and informality. His trip to Moneygall, which was one of those towns you sped through on your way between Dublin and Limerick and were never tempted to stop, was different. Here I thought he was most himself. Clearly relaxed and seemingly very taken with the fact that his third great grandfather (who rejoiced in the very unlikely Irish name of Falmouth) had come from this little town. He was in no hurry as he held babies, received hugs and shook what looked every hand in the town. Then he adjourned to the pub in the usual piece of staged PR for Diageo. 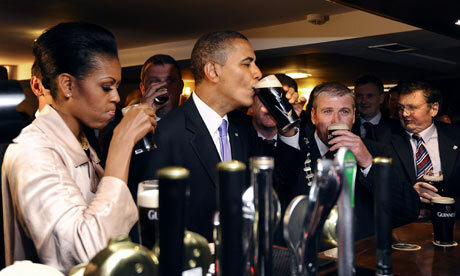 Like Clinton before him – he drank the Guinness, waving it towards the photographers and roaring Slainte! Then it was back to Dublin for his speech to the Irish. I was someone who stayed up into the small hours to watch him being elected in 2008. I am a big fan and so was tempted to go into the city to listen to this man who carries not only the hope of Americans but of the free world with him. But having braved thousands in Dun Laoghaire for the Red Bull Flopfest the previous day, I’d had enough of crowds and so decided to watch from my sofa instead. As I listened I kept waiting to be uplifted. To hear something I could hold onto. To feel that my faith in this man was going to be rewarded with even just an insightful comment which would make it clear that he understood modern Ireland and our current situation. But instead what I got was a speech that seemed to me to have been cobbled together on the flight over, taking more than a little inspiration from both Kennedy and Clinton before him but without the context that both of these predecessors had. Kennedy was addressing a relatively newly independent Ireland and Clinton was marking the Peace Process. Obama is a consummate communicator and a great performer. There is no doubt about that. But is he a statesman, a visionary, a great leader of our time? Not yet he ain’t. As I watched him on TV, I laughed and smiled and felt good. But within minutes of it ending, I was left feeling pretty unsatisfied. It was like eating a McDonald’s meal – tastes great but shortly afterwards you realize you are still hungry. This was no visit, official or otherwise. This was a ‘dropping by’ on his way to bigger and more important business in Europe. His few hours in Ireland provided a bit of R&R for all concerned. And the opportunity to tell us we are a great little country who helped build America; a little island who has had its fair share of dark days but who always overcomes adversity. Had no one told him that only a few days beforehand, in her clipped and formal tones, Banrian Eilis a Do had signaled Ireland’s coming of age and along with our own President Mary McAleese set our faces most definitely to the future. Grown up Ireland should expect far more from the President of the United States, than a photo opportunity with a bloody pint of Guinness and the same old speech telling us we are great. No, there was no vision of Ireland’s role on a world stage, no creativity of thinking, just same ole’, same ole’. Not good enough anymore. No siree. A definite case of could do a whole lot better! Postscript: There was one highlight of the visit though and this is really for the benefit of my American readers. We had all heard about the huge entourage of both people and vehicles that travel with the President. The most impressive of these is the presidential car (of which there is in fact at least two). This car, known as the beast is bullet proof and bomb proof and weight tons. It is truly a magnificence to behold. While waiting outside Aras an Uachtarain (Presidents Residence) it was polished by an aide. The Americans are rightly proud of The Beast. It took a ride over a security/speed ramp outside the American Embassy in Dublin to put The Beast out of commission! The clip is hilarious – listen for the noise of the cars hitting the ramp and then the hilarity of the Dubliners who were watching! I believe the dead beast was finally towed to Dublin Airport yesterday and is now back in Washington for repair. The Queen is very small! When she smiles her whole face lights up. And when she does smile it seems to be genuine because she doesn’t do it too often! 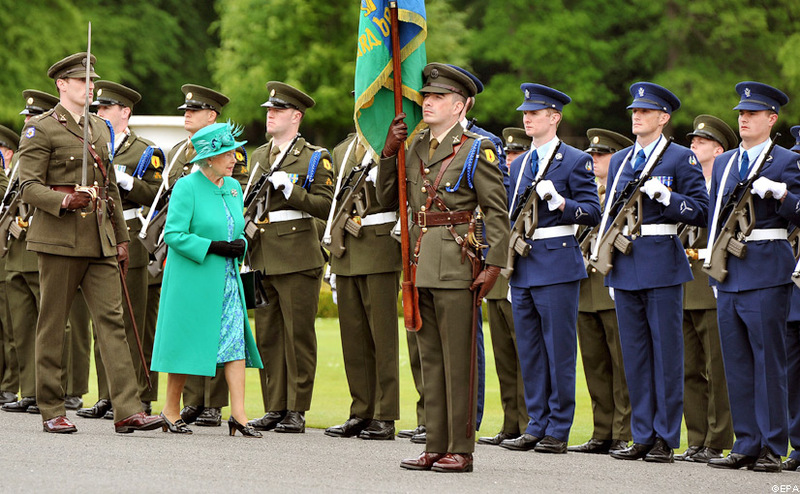 Mary McAleese is some President – and then some. Our defence forces are great. They look smart, do a great drill and have lots of women. And I like the air corps uniform best! Ritual and symbolism carry a very potent power. I feel more secure knowing we have a nice neighbour. Sinn Fein made a most unusual error of judgement in not attending the events of the last few days. It seems like everyone else is moving forward and they are left on the sidelines. The GAA could have involved a few more girls and women in their presentation of their organisation! An exhibition match – even on a reduced pitch with children would have looked better than the Queen and President sitting on chairs on the sidelines watching a video! (Although these observations really confirm that you can take the GAA out of the Parish but you can’t take the Parish out of the GAA). The Queen travelled to and from events in a lovely, sparkling Land Rover but she had a small issue getting out of the vehicle when she had to achieve a sort of slide and jump down to ground level. Could a little step not have been provided? Olivia O Leary is a national treasure. I want to hear more from her. Banrion Eilis a Do has a gorgeous ring to it. I would love to know what vitamins Her Majesty takes – her stamina for a woman of her age is impressive. Prince Philip was a disappointment – he didn’t put his foot in it once! I personally am most grateful to Her Majesty for knocking the economy, bail out and banks off the front pages and the airwaves for almost a week. I feel like I have been on holidays. Poor Barack has a really hard act to follow! Finally, it was a joy to watch President Mary McAleese who was pivotal in getting this visit off the ground, playing such a magnificent role on our behalf. It does rather make one wonder if Presidential candidate, David Norris could achieve the same effect. All in all this State Visit has been a rollercoaster of joy and emotion. Led by our female Heads of State, Ireland and the UK have come a long way along the road to reconcilation during these momentous four days. And it feels good. Very good. At about 5.30pm on the 17th of May 1974 three car bombs exploded without warning in Dublin city centre. 27 people died. At 7pm another car bomb exploded in Monaghan. In total 33 people lost their lives that day and a further 300 were injured. It marked the single greatest day of casualties in the period known as ‘The Troubles’. It was one of the darkest days that I can remember, ranking alongside Bloody Sunday in Derry. And it had a personal relevance. My father was attending a meeting in the North Star Hotel on Amiens Street. I can remember the tension at home that evening until we heard he was alright. There were many such dark days in the recent history of Ireland and Great Britain. Enniskillen, Canary Wharf, Omagh... just some of the place names burned into the consciousness of our peoples as the scenes of brutal atrocities. The 17th of May 2011 will be a day that will also be burned into my consciousness. 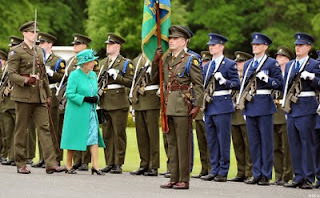 I will remember it as the day when I watched, albeit from distance of my living room, as the President of Ireland, Mary McAleese led the British Monarch, Queen Elizabeth II into the Garden of Remembrance, so that she could pay her respects to the memory of all those who gave their lives in the fight for Irish freedom. 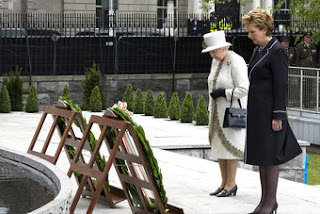 In the eerily quiet city, the only ambient sound was that of helicopters buzzing overhead, the Head of State of the United Kingdom solemnly laid a wreath and bowed her head. It was a powerful image of understanding and of respect. As I watched I became aware that my cheeks were wet with tears. It was profoundly moving and deeply emotional. My grandfather fought during the War of Independence and I am very aware, somewhere deep inside my soul, of his bravery and that of other untrained ordinary men and women who pursued an impossible dream and made it real. My generation is the bridge between that past which, to me, seems so reasonably recent and our nation’s future. I feel the passion that drove the final push for freedom in an almost tangible sense. It is beyond explanation but it’s something that I carry in the very essence of my being. My children are aware of the history attached to the Irish side of their family, the touch of this knowledge no heavier than the sweep of feathers on their skin. They are secure in their Irishness. Their freedom is a given. So it was fitting that I was alone as I watched this momentous piece of history unfold today. I wiped my tears and I thought of my grandfather, George Power of the North Cork Battalion of the IRA. This was the culmination of the dream he shared with all those who down through the centuries pushed for Ireland’s right to self determination. This was the day was finally Ireland was ready to let go of the victim status and stand tall and equal with our former coloniser. It has taken a long time to get to this place. Many have died along the way. Let us all remember this day, 17th of May 2011 when it was two women, two mothers who stood side by side and demonstrated so poignantly that one can honour the past while setting our faces most definitely towards the future. What a day. I had a very exciting day on Tuesday. I was at a conference. I was lucky (for once) and won my place on Twitter, which regular readers will know is one of my favourite places – right up there with Dingle and Cape Cod. Although I got a ticket for free this conference sounded serious stuff and wasn’t any ole two bit event. It was organised by an outfit called Mediacontact.ie whose aim is to “to connect you with your targeted media, get them interested in your organisation and help you to build a presence in the media for your business, project or campaign.” Their conference was entitled Exploding Media and was billed as telling “the story of the extraordinary transformation of the media over the last five years and identify the key trends, technologies and topics that will shape the future for the next five”. So with my still fairly new freelance writer and journalist hat firmly on, I knew that this was a great opportunity I had been gifted. Having spent the last ten years at home mothering and cooking and cleaning and the like, it was some time since I was at a conference. Although in my day I attended quite a lot of them. So first thing I figured was getting there on time – not easy for someone who hasn’t commuted for a decade. I decided the best strategy was to forgo breakfast in order to leave plenty of time for the journey, as I wasn’t sure what the traffic was like and I had to make my way from deepest Cabinteely to Croke Park. It said on my conference info that registration was open from 7.30 and would be accompanied by ‘morning refreshments’. My journey, surprisingly, only took me an hour and so I arrived at about 8.30 and was looking forward to a nice latte and perhaps a danish or croissant for breakfast. Croke Park is a fabulous conference venue but I was amazed (well I was horrified really) to find that the coffee was very mediocre (latte? – forget it – it was coffee – “milk is over there”) and the only food on offer was biscuits! Is this recession or is this standard GAA fare? It was certainly more in keeping with the local club’s after match refreshments than what I remember being available at conferences in the 90s. Anyway once I got over the trauma of having a biscuit for breakfast and very worried that my stomach was going to growl loudly through the morning’s proceedings I made my way into the conference room. For those of you not familiar with Twitter, inserting a hashtag into your tweet enables you to follow a particular conversation around a topic. So while sitting and listening to the presentations I could post my own reactions and comments and follow those of both my fellow delegates and those who were following the proceedings but not present. It takes a wee bit of practice to listen to what is happening in the real world and read and react on Twitter simultaneously. Although a couple of weeks watching The Late Late Show in the company of Twitter is all you really need to do in order to perfect that skill. In order to maximize the value of the Twitter Feed, the organizers had a row of about 10 tweeters at desks who were tasked with tweeting the conference. Meanwhile, at the back of the hall there was a large screen which was displaying the conference stream on Storify. Storify is website which allows users to gather and curate content on social media in order to tell a particular story. In the case of the Exploding Media Conference, this task was given to students from DIT who combined tweets, video and photos in order to build the story. So as I took my place, I was so grateful that I at least had an iPhone so that I could follow the twitter conversation and add my voice to those around me both physically and virtually, although I did come home and write an early note to Santa about an iPad. The day whizzed by and the conference lived up to its name. My brain was exploding with ideas and new information. I came home and regurgitated it all for my poor husband who is still having problems in understanding Twitter! As his eyes glazed over and he began to snore I decided to shut up. I really would love an iPad because Kindles are a bit old fashioned as new online reading may include embedded video and links. Oh and the current revolution of digital media has been compared to the invention of the printing press in its importance. Not so, according to Bill Thompson, head of Digital Archiving with the BBC (so he should know, right?) the digital revolution is going to have the same impact on the human race as learning to decipher symbols, in other words literacy, did. So off I go to ensure that I do not remain analogue in a digital age. CDs apparently look very decorative when hung in the garden where they catch the sun! But in the real world can someone tell Croke Park that good coffee is not a luxury anymore! Sincere thanks to Media Contact for their generosity in offering some free places at what was a really enlightening conference. I really did learn a lot more than what I have outlined above! Promise! The children went back to school today after the longest Easter holidays ever – with two bank holidays thrown in for good measure. But as I struggle to get back into a routine I am not helped by the fact that last weekend was one of the weirdest ever. If you were a visitor from outer space who arrived on Earth late last week, you would have been gobsmacked at just how ‘uncivilized’ and peculiar life on earth really is. The weekend began with the best of stories – love – with the marriage of the beautiful girl, Catherine Middleton to her Prince Charming. Her new husband, William is of course the son of the late Princess Diana – one of the most famous and most loved women on the planet in the 20th century. The spectacle of the Royal Wedding lifted hearts and focused our attention on the human need for love and connection. It also perhaps has brought some healing to the house of Windsor who for the last few decades seems to have been wracked by scandal and divorce and rifts. Friday was the best of days... we the world watched Britain do what it does best – pageantry and ceremony and we shared, at a distance, the celebration and hope that a good wedding should evoke. Saturday was uneventful and was followed by Sunday and the beatification of Pope John Paul II. How to explain this concept to our visitor from Outer Space? I kind of doubt that God holds with the making of saints. I feel fairly sure that hierarchies are very much a human idea and dare I say it, a male one at that, even if it is a hierarchy of goodness. I don’t remember Jesus scoring the disciples on their ‘goodness’. But back to our friend from outer space - even if we could explain the concept of sainthood, venerating a vial of blood might just cause problems. As for retrieving his 6 year’s dead body to bring it to the church again – what’s that about? Can we also explain the simple wooden coffin amid all the priceless splendour of the Vatican? What’s the message there? The men who put this ‘show’ together are all the most ardent followers of Jesus Christ, apparently. Have they forgotten that he was a radical free thinker who lived in a humble life in Israel 2,000 years ago? Does anyone really think he would be happy with the goings on in Rome – at any time, never mind last weekend? Anyway that was Sunday! Actually never mind our friend from Outer Space... I am punch drunk from the events of this weekend. I suddenly feel as if I am not of this planet... after the uplift from watching and enjoying the Royal Wedding, the weirdness of the fast tracked beatification of Pope John Paul II with vials of blood and retrieval of his dead body and then the killing of Osama Bin Laden I am feeling very strangely alien on this planet I call home.